When it comes to doing great listening I find that it’s difficult to do without hedgerows. This term is a little like when people talk about having margins in their life, or perhaps somewhat like taking a regular Sabbath; but there’s something more I want to explore with you. Margins, of course, are neat and tidy. They are consistent. Whoever lays out this book will decide on a number, perhaps around five-eighths of an inch, and three-quarters in the gutter, so you don’t feel the print is mashed up against the edge of the book. It gives everything a tidy feel, so that you have some breathing room. When we talk about margins in life, we usually mean the time you take to get your coffee in the morning, watch a T.V. show at night, or attend a festival with a friend on Friday night or Saturday. “Me” time, down-time. Time spent NOT worrying about all the demands made on you by bosses, spouses, parents, children and even requests for your energy from places where you enjoy volunteering. Okay. I don’t know if you do or don’t have margins on a daily basis or Sabbath weekly, but without them you can’t grow a hedgerow. It makes us all wonder. But that is the point – at least as far as my definition of hedgerow is concerned. It’s a place to wander and wonder. An actual hedgerow is a stretch of semi-wild trees or shrubbery, (perhaps with a path!) which creates borders between fields, a place where foxes can live, blackberries can grow, and children can disappear for the day and come home happy, dirty, and still wondering. It’s right next to cultivated fields, so it’s easily accessible from the places where you normally work, the places you keep much tidier but spending any time tending and exploring the hedgerows only brings you surprises. A handful of edible mushrooms, priceless, not something you expected. When I was a boy we had a creek, woods, places to while away the summer days, unplugged. We could spend an afternoon exploring up the creek, farther each time, we could spend hours building a hut. The best hut was built after workmen with bulldozers cleared a field for a new blueberry patch. They pushed dozens of trees and brush up against the side of the field and into the woods, and on the back side, we found a hollow. We took actual tools, bailer twine, spent hours building sides and a door, cutting and lashing, log cabin style, and camped out. We were so unplugged, so far away that we couldn’t be called for dinner, or to take out the trash – and we liked it that way. We never felt guilty about taking the time to do this. We saw it as a normal way to spend the day. In the hedgerow you may work, but it’s a playful work. You may write an essay and decide it doesn’t fit your book. You may run extra experiments for fun and discover something you weren’t even researching. I believe that a motivational listener needs to not only have margins and Sabbath but also must explore a hedgerow now and then. Perhaps even often. We gain perspective just by looking at the world differently. We follow a trail just to see where it goes; and if it goes nowhere, or to the dump, where we might find some piece of junk we discovered we need in our pocket, so much the better. When we’re used to exploring hedgerows for ourselves, we’re ready to guide others in that same quest. When we listen, we listen for the interesting bits. Not the parts where people are regularly cultivating a field. When I coach, the areas where my client has neatly plowed and planted, the parts of their lives that are in order, are not the places where we can discover anything new. We won’t find the interesting rock walls to climb, the juicy blackberries to pick, and we won’t spot a skunk in their neatly plowed fields. 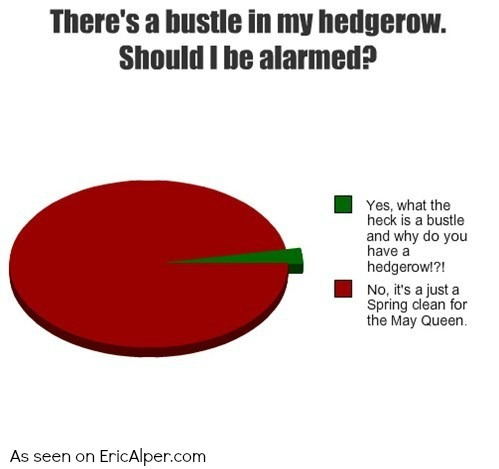 But if there’s a bustle in the hedgerow, I follow it. How do I schedule time to be in the hedgerow? The main tactic to make space for this is to loosen up your schedule. I just re-took the MBTI personality test and discovered that I’m borderline between Judger or “J” (the type of person who likes to have a strict schedule) and the Perceiver, i.e. “P” (the one who likes to keep their options open). I believe that Personality Type isn’t static. I used to be a pretty intense J, but it’s the P who likes to make up stories. It’s the P who has empty space in their schedule, and likes to keep it that way. In other words, partly because I learned to coach and to write fiction between 2009 and 2014 while being under-self-employed meant that I naturally had a lot more room in my schedule than I used to, and I had to adapt to that lifestyle, which meant becoming comfortable again in the hedgerows. I can’t tell you excactly how to loosen up your schedule. That’s a problem for you on an individual level. (If you’re having trouble doing it on your own, you’re a candidate for a wax job). After all, it was somewhat forced on me by a variety of circumstances. One thing I can say for sure is that without it, I wouldn’t be the motivational listener and storyteller that I am today, certainly not with the same quality and excellence. I think this is something that business coaches often don’t really find their way into. They move from high-powered executive positions to hard-charging coaches who are constantly selling and networking, rarely with time themselves in the hedgerows. This makes it difficult for them to invite people into the hedgerow. For those of us in a busy Western world, or in a busy business environment generally (and they tell me now that things are even busier in Seoul and Singapore than they are in the USA). But business people don’t need your help with more cultivation. They need help exploring hedgerows.